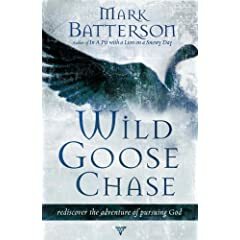 As a part of being able to give an early review of Wild Goose Chase, the author and publisher made it possible to give away a free copy with a contest right here at Thoughts of Resurrection. That’s right, I said free. All you have to do is leave a comment on this post with a reason (or reasons) why I should choose you as the winner of the contest and I will ship a fresh copy of Wild Goose Chase to you free of charge. I will choose a winner from all of the comments and ship the book to you via the USPS on August 18.